Quickly convert numbers to an image in your browser. To get your image, just enter numbers in the input field, adjust the image parameters in the options below, and this utility will convert these numbers to a PNG or JPG image. Created by developers for developers. Fill Color Fill color of the image. Colors may be specified as a name, RGB triplet or in hexadecimal format. Width Width of the image. Height Height of the image. If the width (height) field is empty, the image is adjusted to the width (height) of the numbers. Text Color Color of numbers in the image. Font Size Font size for the numbers. String Typeface Select font, or add a custom. Custom Typeface Enter the URL here to add the custom font. Horizontal Align Align numbers horizontally. Vertical Align Align numbers vertically. Bold Numbers Make numbers bigger. Italic Numbers Make numbers cursive. Padding Distance from the numbers to the frame. Line Height Amount of space between the lines. Numbers to image converter tool What is a numbers to image converter? This is an online browser-based utility for converting numbers to a downloadable JPG or PNG picture. In the input, you can enter numbers in a textual format, and in the output, you'll get an image from these numbers. You can click Save As and download it in any of four supported image formats (PNG, JPG, GIF, or BMP). We offer a bunch of options above to customize your number image. You can specify which color to use to draw your numbers and the color for the background. You can adjust the height and width of the image, and set the distance between the numbers and the frame. You can choose a font for numbers and adjust its size. If you aren't satisfied with one of the offered fonts, then you can add a custom font by entering its URL in the font options field. You can align the numbers horizontally and vertically, and make them bold or italic. Last but not least, you can increase the vertical space between the lines and add a shadow to your numbers. That's numberwang! In this example, we convert a number matrix with custom parameters on the diagonal to an image. We set the light pink color for background fill and dark blue color for elements. 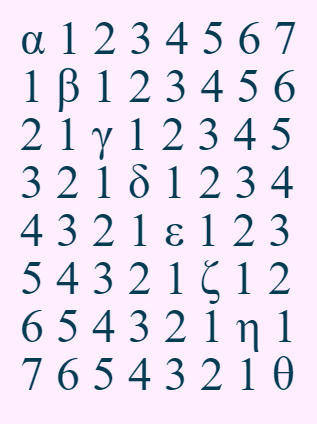 We select the serif font for the numbers and increase the distance from the frame to 20 pixels. default values before applying new ones. 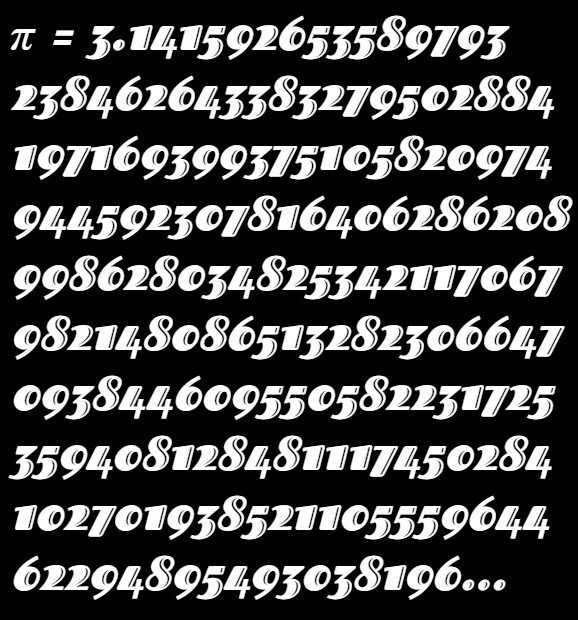 This example creates an image with 200 digits of the mathematical constant π. The numbers are drawn in white color on a black background. We set a custom font called Fascinate Inline, make the numbers italic, and set the padding to 10 pixels. 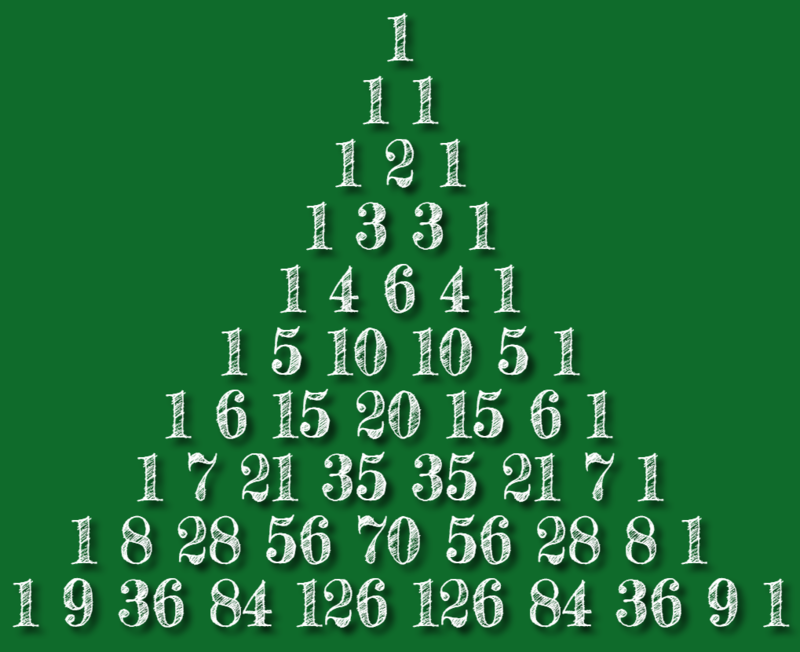 In this example, we create an image of binomial coefficients of Pascal's triangle. We use a Google font called Fredericka the Great and increase its size to 80 pixels. We draw white coefficients on a green background, making the padding of 15 pixels along the edges of the image. We add a shadow to the numbers and align them to the center.